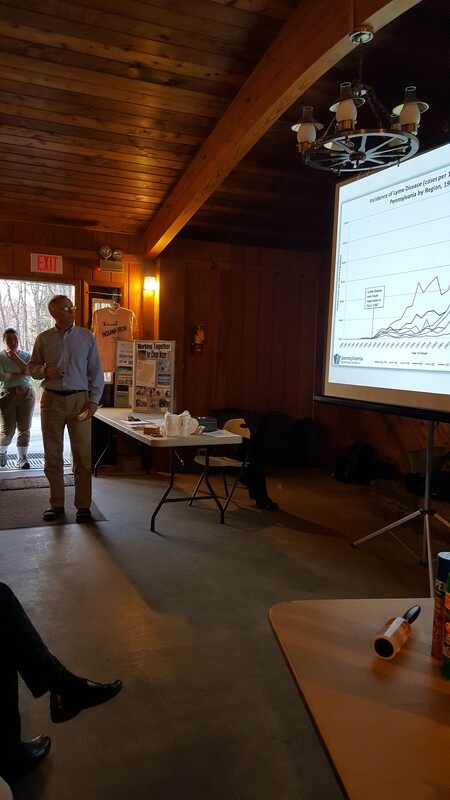 Home » 2016 » April » Spring Tick Program a Great Success! 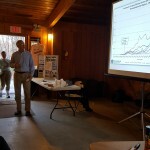 Spring Tick Program a Great Success! This entry was posted in News on 04/27/2016 by Admin. The 2016 spring program Evergreen offered on ticks had the biggest crowd we’ve ever had, at over 100 people. Ticks are a topic so many people are interested in. Dr.’s Tom and Anne Simmons, along with IUP students, gave a very interesting presentation with a lot of good information. Using a good tick repellent, wearing light colored clothing and tucking it in, and finding and removing ticks immediately after being in areas that might be infected with ticks are all good ways to prevent ticks bites and the transmission of Lyme disease. A tick usually needs to be attached more than 24 hours to spread the disease. We learned so much about ticks, current research and also about Lyme disease prevention and treatment. A big thanks goes out to all the presenters, as well as to everyone who came out to learn about ticks!